Our affordable senior apartments offer a full and fun lifestyle with friends and family. Get social with your neighbors in our community room at fun events year around. Keep fit in our cardio and weight training center. Take a break afterwards to relax on the covered veranda or splash in our refreshing lap pool. Stay connected in our tech center with desktops, printers, and free wifi. And when you are ready for some quiet, curl up with a great book in our library. Sansom Pointe Senior Apartments is pet friendly! Bring your furry friend and find the best fit for you to “right size” in our one or two bedroom apartment homes. 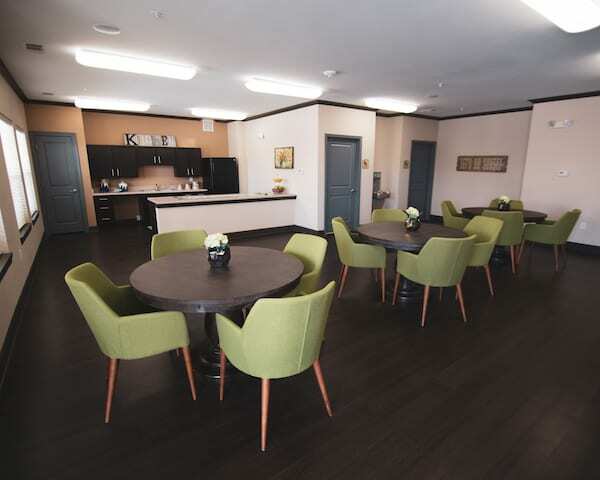 Living at Sansom Pointe Senior Apartments is carefree with modern decorator colors and gorgeous plank flooring. Open concept kitchens are fully equipped with Energy Star rated appliances and microwaves. Enjoy laundry at home with full size washer and dryer connections in each unit. Energy efficient tankless water heaters save you money and reduce energy waste. Abundant storage and closets fit all your needs for comfortable living. We even have covered parking and garages available for you!